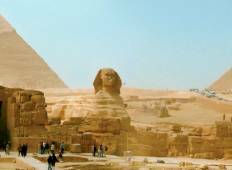 "Vacations to go travel is the only way to tour Egypt & Jordan. We visited Petra,..."
"Amazing trip, couldn't have imagined a better way to experience Egypt"
"AWESOME...great guides with brilliant knowledge base..excellent care all round"
"Booked our tour at the last minute. Magdy and Walaa were very responsive and always..."
"The tour takes you to see so many ancient Egyptian temples that are anywhere from..."